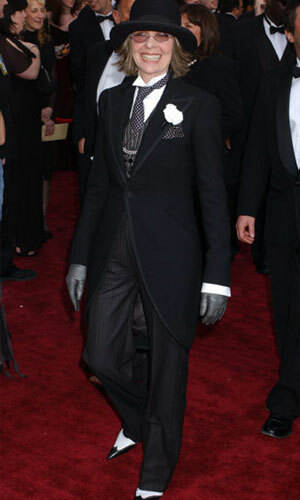 When it comes to the worst dressed Oscars, 2010 has some stiff competition. That’s because the last several decades have seen increasingly outrageous cries for attention disguised as the latest fashions. From dresses that would’ve made Cinderella vomit to items more appropriate for a brothel, we’ll take a look at the worst offenders below. A link has been provided with each picture, but don’t say I didn’t warn you. Kim Basinger (1990) – The lovely Basinger didn’t do herself any favors by personally designing this disastrous faux-princess gown. With a long-sleeved jacket and gloves, the future Oscar winner had enough room under her gown for now ex-hubby Alec Baldwin and his ego. Diane Keaton (2004) – Diane Keaton looked goofy when she dressed up in men’s clothing for Annie Hall. Decades later, it’s even less effective. Courtesy of Ralph Lauren, this ill-advised outfit featured a polka dot tie, pinstripe vest, and even a moronic hat to top things off. Geena Davis (1992) – Did Geena Davis think she was heading to the Oscars or an Old West whorehouse? Cher (1988) – Cher made her mark on Oscar history by winning the Best Actress award for Moonstruck and wearing the most talked about dress of all time. Designed by Bob Mackie, it showed off the great figure of the singer-turned-actress, and the strategically placed sequins left very little to the imagination. Perfect for a Las Vegas show, but hardly appropriate for the industry’s biggest event of the year. 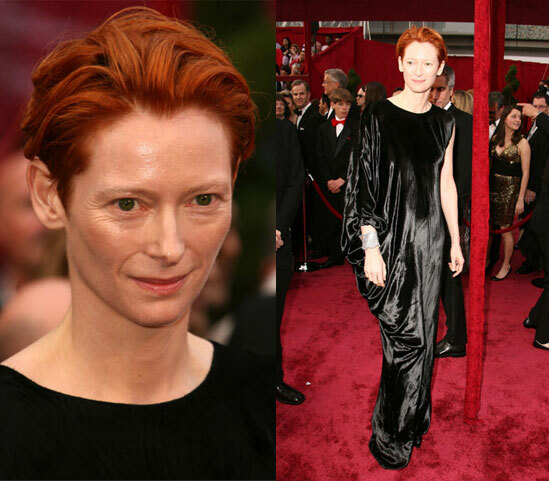 Tilda Swinton (2008) – With almost no makeup and wearing a dress that looked like a Hefty garbage bag, Tilda Swinton took the stage to accept her Oscar for Michael Clayton. While the dress was awful enough, a woman as unattractive as Swinton should wear as much makeup as possible. Yes, I know that’s shallow, but you’d think anyone about to be viewed by millions of people would take a moment and make an honest assessment about their appearance. Bjork (2001) – This dress, which looks like a giant swan trying to strangle the wearer, was designed for the eccentric performer by Marjan Pejoski. What the hell were she and Bjork thinking? And simulating her dress laying an egg didn’t help matters, although it was entirely appropriate on a metaphorical level. Uma Thurman (2004) – I was never a huge fan of Uma Thurman to begin with, and this frumpy outfit from Christian LaCroix did nothing to change my mind. Whoopi Goldberg (1993) – Considering that 1993 was one of the worst dressed Oscars, 2010 will have to work overtime to surpass the fashion disasters displayed by actresses like Whoopi Goldberg. Looking like a reject from a fairy-tale, Whoopi combined purple and lime green in a silk jacket over a jumpsuit. Sadly, she didn’t change into anything better at the stroke of midnight. Jennifer Connelly (2002) – Jennifer Connolly is a lovely woman, though she looked anything but in this wilting disaster from Balenciaga. The peach scarf only served as a reminder that good people sometimes make very bad decisions. Edy Williams (1988) – The exploitation star lived up to her reputation by appearing in a sunhat, fingerless gloves, garters and a lace bra. This was the same year that Cher made her infamous fashion statement, so luckily nobody paid much notice to the desperate-for-attention Williams. This entry was posted on Friday, February 12th, 2010 at 4:16 pm and is filed under Academy Awards. You can follow any responses to this entry through the RSS 2.0 feed. You can leave a response, or trackback from your own site.